The 2014 Tour de France will feature a stage that visits the London 2012 Olympic Park and ends on the Mall after two opening stages in Yorkshire. Leeds hosts the Grand Depart on 5 July, with the stage taking in the Yorkshire Dales before finishing in Harrogate. Stage two of the 101st Tour starts in York and passes through Keighley and Huddersfield on the way to Sheffield. The race last visited the UK in 2007, when London hosted the prologue and the opening stage. "Since the resounding success of the Grand Depart in London in 2007, we were very keen to return to the United Kingdom," said Tour director Christian Prudhomme. "From the bleak moors of the Yorkshire Dales to the genteel streets of Cambridge, the Tour de France's return to England in 2014 will take in some of the country's most spectacular landscapes and historic towns and cities." Britain boasts the reigning Tour de France champion, with Team Sky rider Sir Bradley Wiggins the country's first man to win the event last July. Prudhomme added: "Bradley Wiggins' historical victory last July and the enormous crowds that followed the cycling events in the streets of London during the Olympic Games encouraged us to go back earlier than we had initially planned. "Yorkshire is a region of outstanding beauty, with breathtaking landscapes whose terrains offer both sprinters and attackers the opportunity to express themselves." It will be the fourth time the Tour has visited Britain after previous visits in 1974 and 1994. Yorkshire beat off the challenge of bids from Florence and Edinburgh to host the prestigious event. The county has a rich cycling tradition, with Britain's first Tour stage winner Brian Robinson coming from Huddersfield. Yorkshire's bid had the support of Team Sky's Ben Swift, double Olympic track champion Ed Clancy, Barry Hoban, winner of eight stages of the Tour, and Malcolm Elliott, the first British rider to win a points jersey in a Grand Tour. Prolific Tour stage winner Mark Cavendish, whose mother lives in Harrogate, also backed the bid. Former Team Sky rider Cavendish, who joined Belgian team Omega Pharma QuickStep last October, has 23 Tour stage victories, the fourth-highest total of all time. The opening stage of the 2014 Tour will take the riders north from Leeds through Otley, Ilkley and Skipton before heading into the Yorkshire Dales and ending on the Stray in Harrogate. Stage two heads west from York towards Haworth - the village that was home to the Bronte family - and also passes through Holmfirth, the filming location for long-running BBC sitcom Last Of The Summer Wine, before reaching Sheffield. "It's going to go up and down all the time, like in the Liege-Bastogne-Liege classic," stated Prudhomme. Gary Verity, chief executive of Welcome to Yorkshire, the agency behind the successful bid, added: "The routes of the Grand Depart will showcase some of Yorkshire's iconic cycling climbs and the county's stunning land and cityscapes. "The peloton will be technically tested as they tackle some challenging terrain in what are sure to be two exhilarating days of racing in the county." The third stage will start in Cambridge and head to London via Epping Forest and complete a circuit of the Olympic Park before finishing on the Mall, where the 2012 Olympic road race ended. The rest of the route is yet be to revealed, however stage four will see the Tour head to France before reaching its usual conclusion, after three weeks of racing, on the Champs Elysees in Paris. How did Yorkshire win Tour bid? 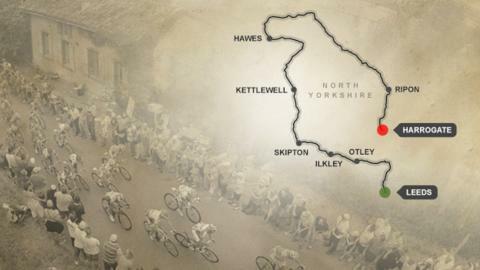 Read more on Tour de France: How did Yorkshire win the bid?